In any good Qigong form there is an opening movement and a closing movement. Although the physical movements may vary from routine to routine and some details and specifics will be different, the internal practice and theory should be more or less the same. 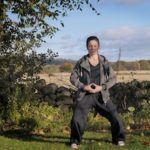 This internal practice of opening and closing a Qigong form is nicely illustrated with the Wudang 5 Animal routines. With all Qigong practice a moment of stillness is required before any movement begins. This allows time to calm the mind and the breath and to become present. Take your time with this preparation. It is as important as any Qigong movement. Give yourself time to relax the body and the breath. Bring your awareness to yourself. This is where you begin to develop your ability to ‘listen’ (ting) to the body and the breath to then help in guiding the Qi. Stepping out to your left, stand with the feet parallel and around shoulder width apart. The focus is to gather and guide Qi to the Dantian. Begin by bringing the mind to the lower Dantian in the belly. The movement will begin from the belly and extend down through the hips, down through the legs and out of the feet into the ground. Simultaneously we want to guide movement from the Dantian up through the spine, passing through the shoulders, along the lengths of the arms and out through the hands and fingertips. This will guide the physical movement of raising the arms up and out from the sides of your body. Allow the mind to guide the movement in the body, bringing the focus from Dantian to the hands and feet. The sensation or idea should be similar to that of casting a fishing net out into the sea. Then we bring the mind back to the Dantian as we draw in the palms of the hands to rest on the belly. The thumbs come together at the navel and one palm rests on top of the other to form a circle on the belly where the Dantian rests behind. This sensation or idea would be as though you are drawing a net back into the body and into the lower Dantian. This opening movement is repeated three times. In essence, the focus is to bring any excess Qi in the body back into the lower Dantian. Allow the arms and then the fingertips to open and extend to the sides of the body. Try to feel that the body is open and connected from fingertips to fingertips. At the same time the feet should feel as though they are sinking into the ground. Allow yourself to push the feet down gently so that the legs straighten. Turn the palms up and raise the hands above the head. Reach straight upwards, though the fingertips. Try to feel the connectivity through the entire body. Focus on the light and open fingertips reaching skyward and the heavy feet sinking into the ground. You should feel a gentle stretch throughout the body. Relax and soften your stretch. Bend slightly at the wrists and push the palm down in front of the body, guiding the Qi through the body into the lower Dantian. At the same time relax the legs and bend the knees slightly. Bring the mind to the Dantian. Keep the mind in the lower Dantian as you relax the arms back to the sides of the body and bring the feet back together. Do not move too quickly. Keep the body still and quiet for a short while. Keep the mind focused on the Dantian and feel that the body and the breath are calm and relaxed. See also our follow up article WUDANG SINGLE TURTLE MOVE QIGONG!